We went into downtown Cascais first thing in the morning and chatted with a travel agent, Susana, for a while about putting together a trip to Oporto for us for next week, then went over to the Tourismo office and picked up two Lisboa Cards, which serve as passes for the trains, buses, trams and metro, and give free admission or discounts into many attractions. 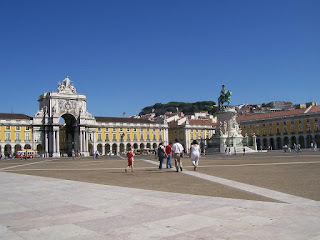 We walked to the train station, hopped on the train to Lisbon, and relaxed to enjoy the ride for about a half hour. 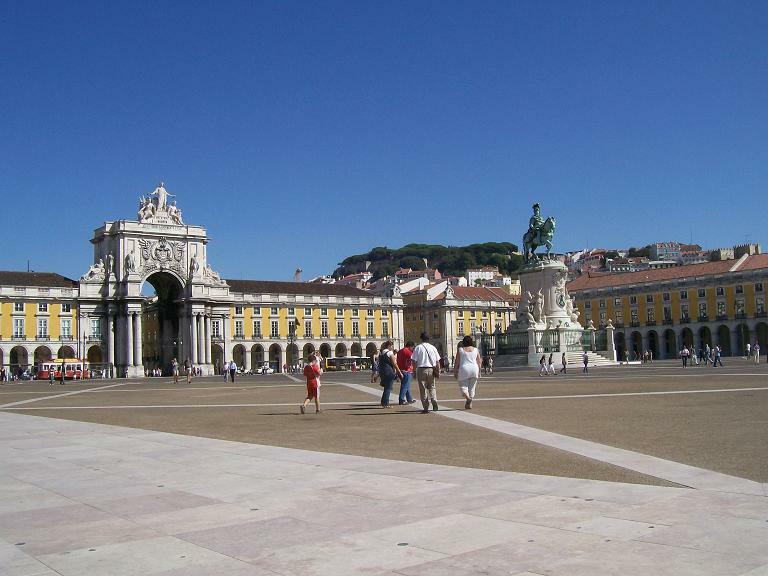 The station at the end of the line is about a kilometer short of the Praca do Comericio, which sits at the foot of the Baixa district, and is known by Manny as "the place with the guy on the horse". We hoofed it, ourselves, to the Placa. From there, we walked several blocks to the place where trolley #28 stops, and jumped aboard, using our passes. While this is a very quaint and amusing way to travel, in the trolley we were packed tighter than sardines (a local delicacy) in a can, and we jumped off after a short distance at the Miradou de Santa Luzia, a great viewpoint from which to catch sight of Lisbon for the first time, never to board public transport again, aside from the train ride home. By this time, it was nearly noon, so on our way afoot up hill, we stopped at a little sidewalk restaurant - there are hundreds of small places, everywhere - called Comidas de Santiago, and Michele had bacalhau a bras, a traditional cod dish with rice, and I had dourada na grelhe com batatinhas em casca, grilled bream with potatos and vegetables. All extremely delicious, and we cleaned our plates completely. Proceeding further, and still on our tour plan, up the hill to the Castle of Saint Jorge, where we bought discounted tickets, and got to browse the museum of pottery shards - not its real name, but that's about the extent of the collection. The site has been occupied by people for thousands of years, and everything from bone needles to terra cotta roof tiles were left behind. The castle, itself, has been restored over the years, and its walls are great to climb on, and a great photo opportunity, with more lovely views of the city. Be sure to check out the medieval sound systems while you are there, they're still used for concerts today. At this point, our carefully laid plan began to fall apart, as we decided to head directly for the Convento do Carmo, rather than following the tram line back down the hill, and we didn't see the area where the free buses were shuttling folks back to the square. Our maps didn't contain any of the warren of narrow streets that we encountered, and we navigated by sun and stars until we finally came to a place called Martim Moniz that was listed on the map. It was hot, sweaty work and Michele and I were both growing a bit cranky by the time we got ourselves oriented and on the way to our next landmark, the Rossi, which contains a major train station. I was walking east at one point when I realized I wasn't quite sure that was taking us where we wanted to go after leaving Rossi (I still got confused, just writing about it), so I did an about face, and was fortunate enough to spot the Elevador de Santa Justa, one of the ways up the hill to the convent. Our passes gave us a discounted entry to the Convento do Carmo and Archeological museum there, and it turned out to be cooler inside, complete with a WC, which made it all worthwhile, above and beyond the interesting artifacts there. Public restrooms are a little sparse and difficult to find in the city, so you find yourself going into a small cafe and buying something to eat or drink, in order to use the facilities. The convent was partly destroyed in 1755 in a massive earthquake here, and never rebuilt. We spent a half hour or so here, relaxing and enjoying the museum, sitting on the steps and having a drink of water. After leaving the convent, and stopping at one more church nearby, we decided that was about enough of museums for a while, so we broke off the original plan and began to alternate guide books for ideas on where we wanted to go next. We went to the Miradou Sao Pedro de Alcontar, another nice park where you can relax on a bench with a cool drink and look out over the east side of the city, then on up the road to the Praca Principe Real, a gorgeous park filled with trees and with some truly amazing fig trees, reminiscent of one from my childhood in Santa Barbara that's hundreds of years old. There's a "water museum" listed in the guide book that we decided to go see. Big ripoff. Just a stone water tank, no displays, no tours, no discount with our card. Onward to the Jardim Botanical, where we wandered for a while among the trees and plants in the shade. A great place to wind down, and you could probably spend hours there. Unfortunately, it isn't free with the Lisboa card, and the butterfly exhibit had closed at 5, so we weren't able to enjoy all it had to offer. I was waiting on a bench for a while in the spot pictured above for Ranger Murray to come give a nature talk, but I guess he must have been busy. Enough of Lisbon for one day on our plate, though we took a number of photos of more statues along the way downhill, we headed back to the train station, went back to Cascais, and had a fantastic meal of seafood stew for two at a restaurant called Checkers. Full and happy, we went back home, and eventually, to bed.